After posting last nights killshot, I got complimented on my raiding UI, and asked about what addons I use. I got quite surprised by that, because I feel my UI is more of a "works perfect for me" but not what I would classify as a "pretty UI". I made it myself, because no matter how pretty I think other UI's look (ElvUI and others) I can not use them in a stressful environment that is much of my raiding time. I suddenly find that I am lacking some critical (for me :P) information and then I get even more stressed and with stress comes rage. :P Yeah, I get pissed off if I cant see the information I want right away (Buffs, debuffs, my shields etc). That means you can move/add/remove all the buttons and make them exactly how you like it. And what I really like is that you can make one standard one and save it -and then whenever you make a new character you can import that setting from Profiles and smack its perfectly setup, just the way you like it. A true raider can not live without bossmods. In my case that is BigWigs. You also have a bossmod named DeadlyBossMods (DBM) but I have used BW for years so I'm stickin' with it. :-) There you can also adjust after what you need more information about. 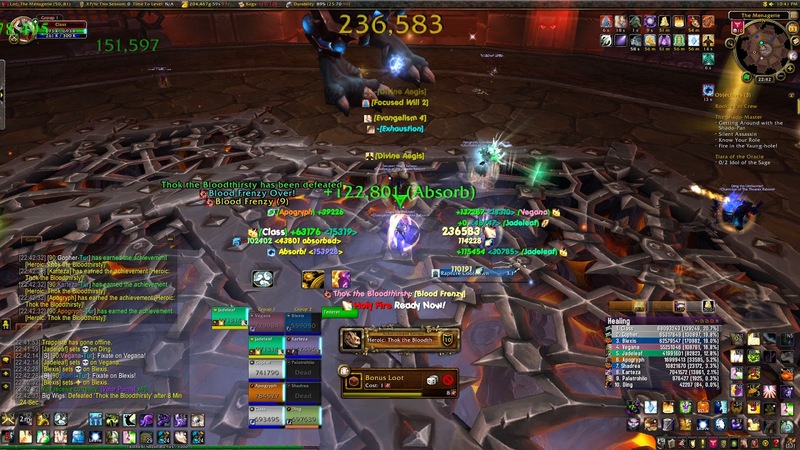 Like on Nazgrim heroic in SoO you need (as disc atleast) a timer/warning/notification when he is casting execute on the tank, so you can make sure the tank have a shield on him when it hits. Makes it much smoother. Or other things you need information about. For information about when important spells are up, I use an addon called WeakAuras. There you can add spells that have a CD and that you want to know asap when is up. In my case that is things like Inner Focus, Spirit Shells and whatever lvl 90 talent I am using. I see that Halo shows on the screenshot, even if I am using Divine Star on that fight, but I have added all 3 lvl 90 spells on WA because I tend to swap a lot between them. For damage/healing meter I use Skada. Its very handy, you can see how does how much dps/damage/hps, dispells etc etc. You can also customize it. Take me for example, I have poor eyesight (comes with age :P) so I need to have bigger types on the text but that is fine. It also shows things like death, and what killed people, which is useful at times. All the floating numbers are from MikScrollingBattleText -its an addon that makes it easier to see combat information. I also use an addon called Castbars. It makes me able to move the casting bar of my character to anywhere I want on the screen -the default version dont work well with the rest of my UI so I use Castbars to move it where it is more useful.